It’s another Eee PC: hooray! As noted in the review of the MSI Wind last week, Asus’ response to the myriad of potential suitors to its netbook crown has been quite wide ranging. Today is the fourth Eee PC model we’ve reviewed and Asus lists no less than eleven different configurations on its website, split between six different models. With another Intel Celeron based version, the Eee PC 904, also due to appear soon, it’s a messy and confusing range to say the least. 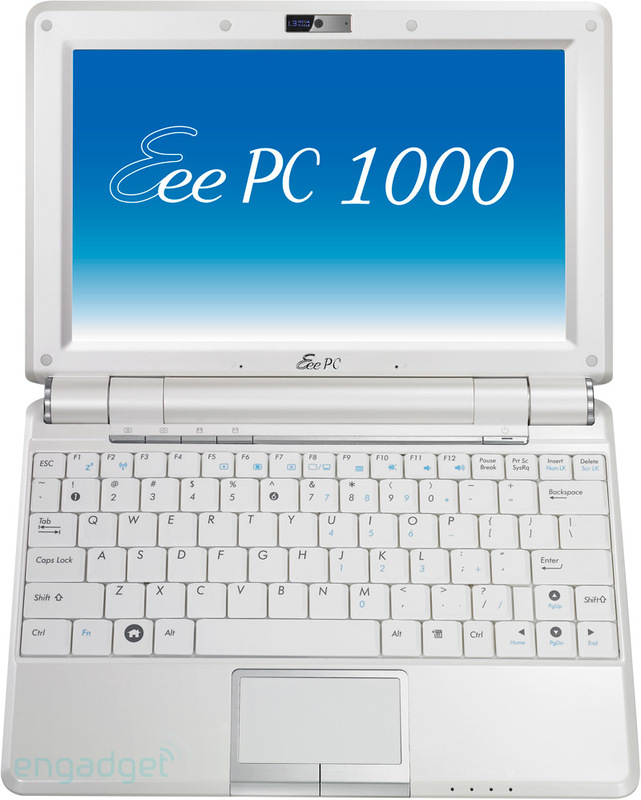 So, the Eee PC 1000 – what sets this apart from the rest? It is ostensibly Asus’ answer to the likes of the MSI Wind, featuring as it does a near identical 10in, 1,024 x 600, LED backlit screen, a larger and more comfortable keyboard and consequently a larger chassis as well. Measuring 266mm across the Eee PC 1000 is around four centimetres wider than the 901 and at 191.2mm deep, about two centimetres deeper as well. It also weighs more, at 1.33kg compared to the 1.1kg of the Eee PC 901. Indeed, as our shots show, it’s also slightly wider and deeper than the MSI Wind, though not devastatingly so. Does this extra size matter? As ever it depends on how you use it…your netbook, that is. We still hold the form factor of the 901 in high regard and it’s definitely a degree or two more portable, but if you do want a better keyboard then the extra size and weight of the 1000 is a small and very bearable price to pay. Moreover, though many still lament the fact that you could get a larger and more powerful laptop for around the same price as one of these, the difference between a 1.3kg 10in machine and a 15.4in, or even 13.3in and 12.1in, laptop is quite substantial. 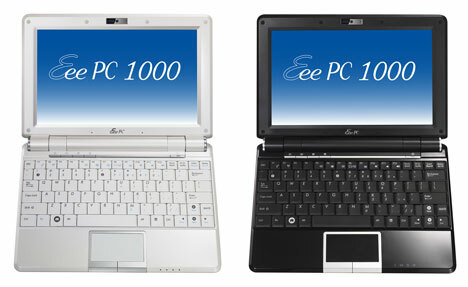 Apart from the size, visually the Eee PC 1000 is basically identical to the 901. It has the same glossy finish, same logos and the same basic arrangement of connections. It’s still an attractive unit all in all, but in this size bracket the MSI Wind probably has the edge in the aesthetics department. It simply looks and feels a little slimmer and sleeker, though its smaller touch pad is a minor negative. Inside very little has changed. You still get a 1.6GHz Intel Atom CPU, 1GB of RAM, Wireless-N, 10/100 Fast Ethernet and Bluetooth, but you do get more storage. Our Linux sample comes equipped with 40GBs worth of solid state storage and the Windows version, the Eee PC 1000(H), comes with a 1.8in 80GB mechanical drive. Thus, for the Linux version at least, you get double the storage of the 901, while the 1000(H) features four times the amount of storage of the Linux version of the 901 and six and a half times the storage of the Windows 901. These are, obviously, pretty significant amounts and though you lack the peace of mind an SSD gives in regards to durability, if you want to use your Eee PC more extensively the 80GB HDD is a compelling option. Asustek unveiled today the Asus Eee PC 1000, a 10-inch screen version of its popular low-cost mini-notebook, at the 2008 Computex show in Taipei. According to a specifications sheet, the 2.93-pound Eee PC 1000 comes with the Intel Atom processor, a 40GB solid state drive, 2GB of RAM, 802.11n wireless module, Bluetooth, a built-in 1.3-megapixel web camera, and Linux operating system. Asustek claims that the Eee PC 1000 has a battery life of up to 7.5 hours. Engadget says the 1000 is priced at approximately $658 in Taiwan. Currently, there is no official information on its availability and pricing in the United States. According to a post at Liliputing the launch date for the US market is July 8th. The company also unveiled theEee PC 1000H and the901 Series at the Computex expo. This entry was posted on August 14, 2008 at 2:44 pm	and is filed under ASUS Eee PC 1000. Tagged: ASUS Eee PC 1000. You can follow any responses to this entry through the RSS 2.0 feed. You can leave a response, or trackback from your own site.